Mergers and acquisitions, weather crises and factory fires were among the main causes of global supply chain disruption in the first half of 2018, according to Resilinc data. Global supply chain disruptions continue to grow at an alarming rate and the potential for financial or revenue impacts is the highest it has been in three years, finds Resilinc's recent EventWatch Supply Chain Disruption report. In the first half of 2018, Resilinc notified a record 1,069 events within six months, the highest since the risk management company began monitoring in 2010. Of those events, more than 300 of them directly impacted supply continuity. Among these, natural disasters and weather-related events continue to be a major source of disruption across the globe and especially in the United States, continuing a trend started in 2017. In addition to natural disasters, factory fires continue to pose a significant threat to supply chains. More than 700 events, including tariffs, mergers and acquisitions, force majeures, price fluctuations, and cyber attacks, indirectly impacted supply chains. 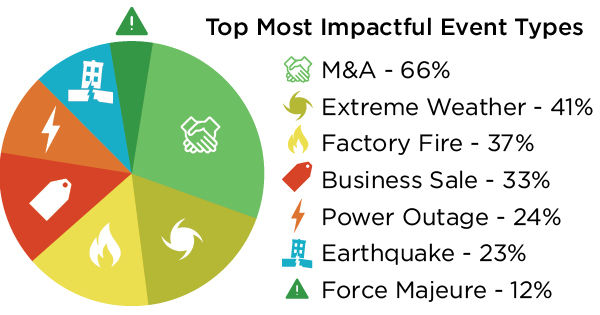 Factory fires were the most frequent event type in the first half of 2018.